SCD Group: Augmented Reality in Your Association’s Future? Now, you want to talk about change! Many college yearbooks stopped publication in the 1980s. Some have been revived. And, some new ones have made radical updates. Because of my yearbook experience, I was drawn to this story about today’s high school yearbook. Traditional yearbooks get a high-tech makeover by Jennifer Reed in the News-Press. Traditionalists, fear not: Teens value the permanence of the printed yearbook as much as they do the tassels they'll hang on rearview mirrors. "But you need to link the computer in their hands to a book," says South Fort Myers High adviser Gina Sabiston, who sees declining student interest in all things print. "If you could have this technology in a textbook, it'd be fantastic," Sabiston says. Yearbook sales have declined modestly in recent years, according to Alex Blackwell, Walsworth vice president of marketing and communication. New innovations are stabilizing those sales, he says. 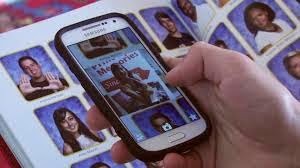 In addition to the 3D app, Walsworth has introduced a Yearbook Shout feature using similar technology that allows students to record videos of themselves bidding fond farewells and Yearbook Snap, soon-to-be released photo-sharing app. Walsworth's innovation may simply be a response to a changing market and the ubiquity of handheld technology. But it's worth asking: If a yearbook company can revive student interest in print, will other publishers follow suit? That technology may be on its way. Annie Weinberger, the general manager of Aurasma at HP Autonomy, can't reveal anything that's not been made public, but she says there's a lot of interest in that category. Teachers are asking for augmented reality texts, and until those are available, they're finding lots of other ways to use it — anything from bulletin boards to teach students how to tell time to vocabulary building to art instruction. "Combining traditional print materials with rich media undoubtedly makes each page even more substantial during the learning process," Weinberger says. "It also give students an alternative way to get more information on-demand and through familiar mobile devices they use every day." Milando taps her cellphone, which is resting on the desk beside her computer keyboard. (Yes, when you work on multimedia projects in school, phones are allowed). "We are so dependent on technology. We can't have a phone more than a hand's distance away from us. We are tech hungry," she says. And judging from the reaction of Stephens and other students crowding Sabiston's classroom, that's most certainly true. "I came to school just to get this," says Stephens says, who was otherwise done with classes. "It's so cool." Associations may not have yearbooks but the high schoolers experiencing augmented reality will soon be your members and eventually your leaders. If they experience this technology in a high school yearbook, they are going to expect (perhaps even demand) it in their association publications and educational programming. Think about the potential: a speaker’s handout includes links to videos and/or photos to highlight key points. This offers huge opportunities for visual learners!